All transactions are safe and secure with a reliable history in online purchasing behind each of our associates. Buy the Lightning McQueen t-shirt to own Cars clothing and merchandise. This pedal to the metal design features the Lightning McQueen quote, "Speed. I am speed." This Disney Cars t-shirt is available in sizes for both kids and adults. In order to mentally prepare himself for the race, Lightning utters the quote at the beginning of the movie just prior to the start of the Piston Cup. The race ultimately ended in a three-way tie that resulted in a tiebreaker race being scheduled for a week later. Let everyone know that you like to go fast by wearing this cool design that will have you repeating the McQueen quote, "Speed. I am speed." 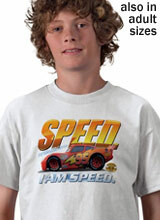 In addition to the Lightning McQueen tee above, browse the Cars Clothing Gallery for more apparel like men's and women's clothes, kids shirts or hoodies.